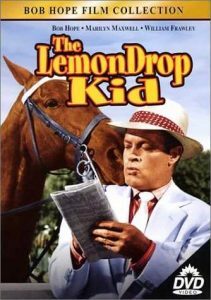 Bob Hope plays a small-time con artist with a fondness for lemon candy in this film based on a Damon Runyon story. When the Lemon Drop Kid accidentally cheats gangster Moose Moran (Fred Clark) out of his track winnings, the Kid promises to repay Moose the money by Christmas. Creating a fake charity for “Apple Annie” – Nellie Thursday, the Kid tricks his gang into donning Santa suits and collecting dough for old dolls like Nellie who have nowhere to live. Radio personality Marilyn Maxwell assists as the Kid’s girlfriend, while William Frawley and Jay C. Flippen play the lovable, gruff crooks that fall for the Kid’s Santa scam. Race track guard 1: [about the Lemon Drop Kid] And to think that I bought one of his tips last week. Race track guard 2: You, too? Moose: What’s the matter, Kid, you look kind of sick? Sidney Melbourne (Bob Hope): No, I always turn green this time of year. Sidney Melbourne (Bob Hope): First doctor I ever met who keeps what he took out and threw the patient away! Sidney Melbourne (Bob Hope): It’s all the same to you if Sam [the surgeon] kills me know or doesn’t open me ’til Christmas! Sidney Melbourne (Bob Hope): That judge didn’t look honest to me! Police officer: He’s been on the bar for fifteen years. Sidney Melbourne (Bob Hope): That’s just what I mean! Drinking on the job! Little Girl: Are you coming to my house Christmas eve? Gloomy Willie (William Frawley): Sure! Little Girl: Will you bring a doll? Gloomy Willie (William Frawley): No, my doll’s working. Sidney Melbourne (Bob Hope): [blowing snow off the head of a statue] Dandruff! Gloomy Willie (William Frawley): What’s a cow doing inside a house? Sidney Melbourne (Bob Hope): Milton Berle is on tonight. Old woman: You’ve still got your hourglass figure, dear. Sidney Melbourne (Bob Hope): [in drag, disguised as an old woman] Thank you, dear. Old woman: but most of the sand has settled to the bottom. Gloomy Willie (William Frawley): You’re sweet too, pickle-nose … bring the chair. Sidney Melbourne (Bob Hope): Santy Claus don’t drink. Gloomy Willie (William Frawley): Oh, no? Well, how come he’s always falling down chimneys?